The water industry not only wants to get smarter; it’s trending towards a “Digital Water Industry” driven by political will. But the concept of a smart water industry — or Water 4.0 — has to be driven from the bottom, making sure that the right infrastructure and sensors are in place so that the right data is collected, thereby enabling the informed decision-making at the center of Water 4.0. The recent Sensors for Water Interest Group (SWIG) workshop, hosted by ABB, addressed where we are regarding the state of wastewater monitoring and how this can be used to drive the industry to something approaching Water 4.0. The first thing to do is to look at the structure and identify what needs monitoring. This will help the industry deliver a holistic approach to its wastewater operations from the customer’s home to the treatment works. The journey of water from its sources into the collection network is largely unmonitored at present, so one of the fundamental challenges is to attempt to measure what passes through our collection networks each and every day. Apart from customers, one of the almost unmonitorable inputs is from rainfall, but technology is certainly moving in this direction. Rainfall radars, advanced rain stations, and advanced analytics platforms are able to measure the type of precipitation; and with artificial intelligence (AI) and machine learning, there is the ability to measure the impact on the sewer environment and adapt network operations accordingly. As water enters a gravity-fed sewer system, monitoring has been virtually impossible in the past. It is only through recent work, led by the University of Sheffield, that we are seeing progress in this area. Free-surface dynamics, acoustic holography, and microwave sensing have all shown potential for measuring free-surface flow within the gravity system, allowing us to picture what is going on in the sewer network. The work is still under development, but the results are thus far promising. Within the pumped wastewater network, developments are a little further ahead. Flow meters are actively being installed at the current time, but there is also experimental work happening in collaboration with water companies. Lorenzo Pompa of Anglian Water and Mark Hendy of Syrinix are specifically looking at what can be done with pressure monitoring. It’s a technique that has been used for many years in the water distribution network, but not in the wastewater collection network. 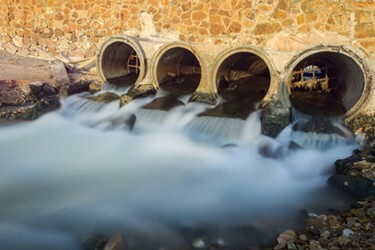 The ongoing work examining how high-frequency pressure monitoring on the rising mains to the wastewater treatment works can be used to predict mains failure, which would help to limit damage to infrastructure and avoid pollution events. 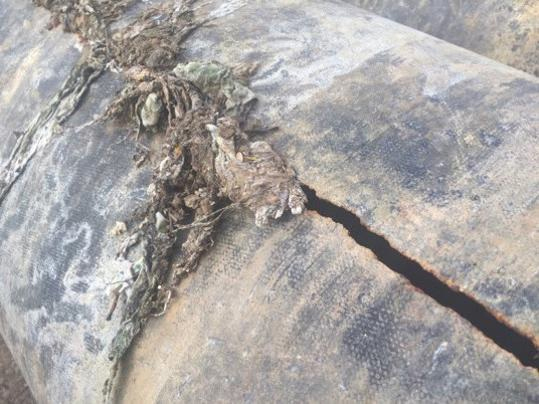 A case study presented to SWIG showed a large crack that developed in a 600mm (24”) rising main (Figure 1), causing slow failure of the pipe. Luckily, the monitoring in place was used to avert actual pollution, aptly demonstrating the usefulness of the technique. Characterization of the collection network is the first step toward Water 4.0, and control of the network leads to overall improvements in the water environment. But with sensors at the heart of Water 4.0, we have to ensure that the data received is correct; otherwise, the analytics engines will produce information based upon false assumptions. Only with good quality data is there possibility to optimize the processes within the wastewater system as a whole (Figure 2). The basics of clogging, poor installation, fouling, lack of calibration, and managing the uptime of instrumentation are among the challenges to the industry in Water 4.0. These are being actively worked upon by instrument manufacturers as they try to limit maintenance requirements, install cleaning systems, and provide instrumentation installation advice that will eliminate major sources of error. The next step is to improve calibration and maintenance management systems (CMMS) to ensure that what is in place is recording accurately. The online and laboratory instrumentation manufacturer Hach has gone one step further with its Claros system, which can tie the laboratory and the site together to verify that the reading at the time of sampling is correct. The Claros system supports the instrumentation lifecycle — from mobile sensor management to predictive diagnostics to onsite visualization and display — helping operators to understand the operation of the wastewater treatment works on a holistic basis, rather than element-by-element. This allows for the improved management of the works and the potential for the installation of real-time control systems. Characterization of the collection network is the first step toward Water 4.0, and control of the network leads to overall improvements in the water environment. It is the control system element on the treatment works that is vital, and whether you look at instrument-based process control or holistic management via multivariate process control, some of the challenges have always been sensor-based — e.g., how they cope in a harsh environment. Organic load/biochemical oxygen demand (BOD) and the actual performance of secondary treatment in activated sludge plants have been particular concerns; to a certain extent, it has been a case of designing the concrete box correctly and letting the biology look after itself. Technology has moved on, and where 50 years ago the use of respirometry was experimental at best, it is now actively used as part of a multiparameter activated sludge plant control system. This allows for more efficient operation of this part of the wastewater cycle. Couple this with final effluent BOD monitoring and it is possible for the treatment part of the wastewater cycle to be finely tuned to maximize both treatment and efficiency. The instrumentation level is one of the key fundamentals of Water 4.0, and there is a need to ensure that this level is producing good quality data for the more advanced techniques starting to appear in the water industry, with huge potential for optimized operations. The flip side, of course, is that the data is wrong and so the assumptions based on the data are also wrong; then the industry faces a future where we have a “resistance to the effective use of instrumentation” and are stuck in a cycle where technology “doesn’t work” — a future that becomes more bleak as the pressures demanding greater efficiency start to bite. WATER 4.0 puts digitization and automation at the center of a strategy for resource-efficient, flexible, and competitive water management. In doing this, WATER 4.0 incorporates the same main features and terms of the industrial revolution INDUSTRY 4.0, such as “networking of machines, processes, storage systems and resources,” “smart grids,” (and) “Internet of Things and Services,” and brings them together in a systemic, water management context. In the implementation of WATER 4.0, Cyber Physical Systems (CPS) are drivers of the optimal networking of virtual and real water systems, with planning, construction, and operation being largely done by software. This allows the intelligent networking of water users (agriculture, industry, and households) and components in a sustainable water infrastructure with the environment and the water circuit, and follows a holistic approach along the value-added chain. Furthermore, WATER 4.0 allows a high degree of transparency for water users, thus covering current needs, and provides opportunities for sustainable, creative activity areas in water management.